I bought a piece of wood/mdf in the scraps at Home Depot. It cost me $1.00 (I bought like 2 more). I gave it a coat of white paint from my stash. 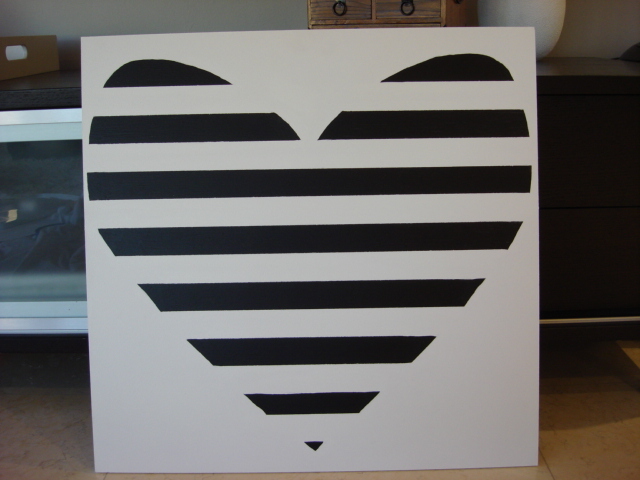 I got a poster board folded it in half and drew half a heart on the poster. 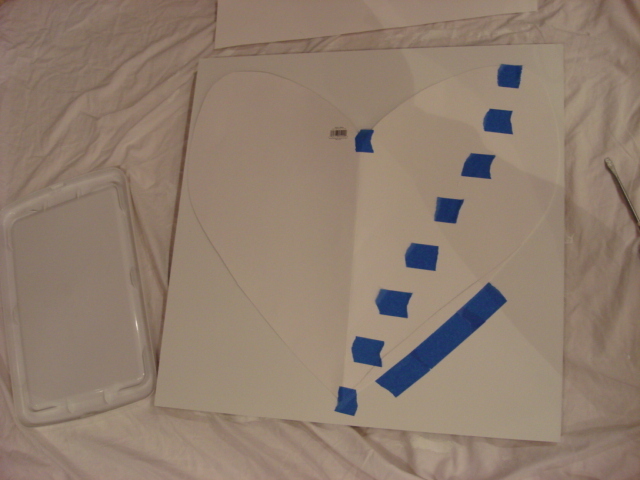 I cut out the heart and then used some tape to measure out my lines. I know there is a mathematical way to figure this out, but I do things my way. 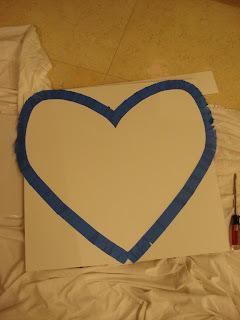 I then laid the heart on the painted wood and just taped the outside edge of the heart. 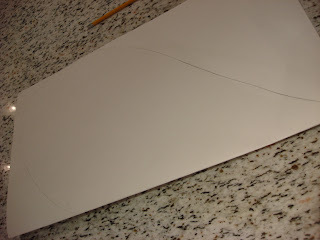 I did not trace it out because I didn't want to have to deal with repainting the white. 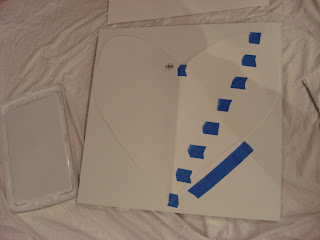 I tore small pieces of tape at a time to get the rounded edges. Then I laid out my stripes evenly spaced. I wanted the black at the top and the bottom to give the heart shape. 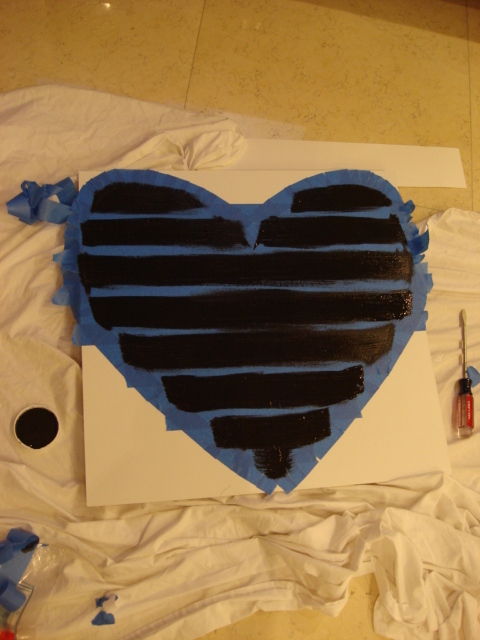 I painted the inside of the heart black. 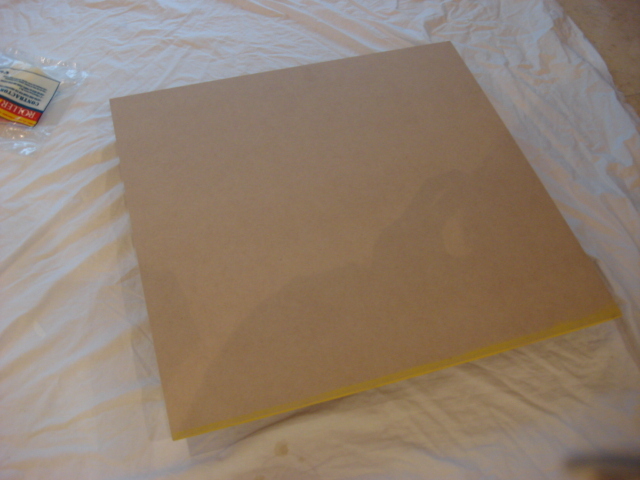 Be very careful to attach the tape as best as possible to avoid bleeding of the paint. It happened to me and I had to go back and fix it. Double the work. Here it is. I think it's really cute and I'm happy with my first painting attempt. I'm trying to figure out how and where to hang it. I'll keep you posted. What do you think? Have you tried painting? Please see pages on the left sidebar to see what parties I've joined. Looks great! 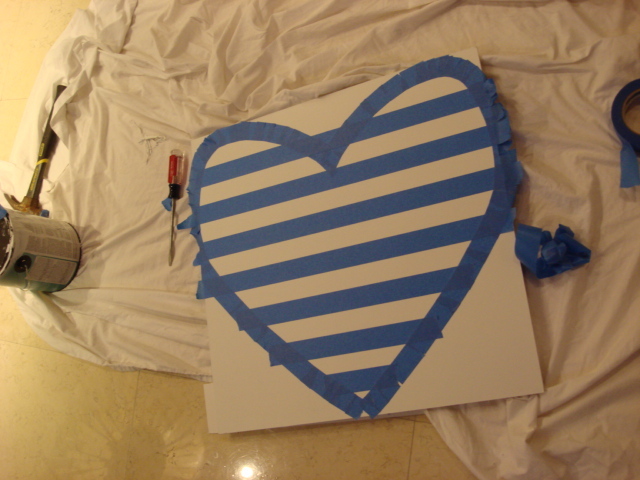 I love black and white stripes! I Must Do This! How retro and modern at the same time! This is my favorite stripey item at the moment--and trust me, I am loving many stripey items at the moment! Super post! Are you gonna show us where you hang it? Happy weekend! xox! Cute! 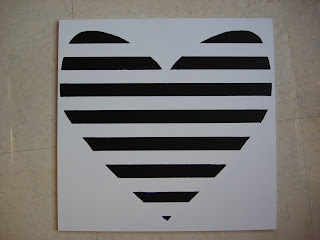 I love anything black and white striped! 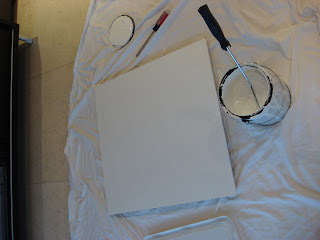 I love painting it's so much fun. pretty awesome! I'm impressed your lines didn't bleed...I normally don't do projects like this because I can 't get them as exact as yours - kudos! This turned out great. I love anything black and white and this is perfect. That turned out great! I too am in love with stripes and chevrons right now! I really love this project! Thanks so much for sharing. I think I'll have to try it! I think this is so cute! Where are you going to hang it? I'm linked up by you on a couple link parties. So cute!!! 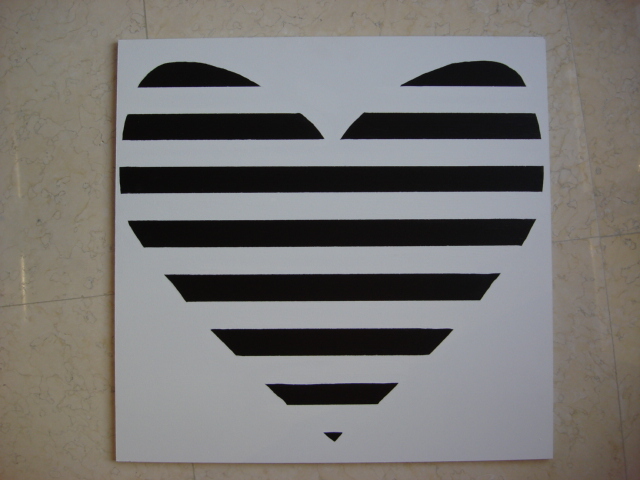 I'm crazy for black and white stripes! you always come up with the most creative projects! This is so cute! I'm a brand new follower - would love if you'd check out my blog, too. That is adorable! I love the black and white! Very bold and cute! Thanks so much to linking up to Beyond The Picket Fence. I love this! it's so simple, but just perfect! I was inspired by your post (as previously commented!!) and am gonna link my post tomorrow to you! woot woot! xox! You make it look easy! Maybe I could actually do it? I like that it's inexpensive! I'm a new follower from the Creative Bloggers' Hop! Hope you can hop by my blog too! What a great project. I am a follower now. 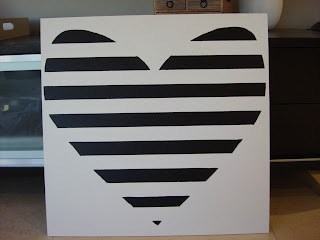 Check out the chevron art I did at www.timberandlace.blogspot.com on Thurs. WoW ! I love this.... Yours has turned out perfect... ! !